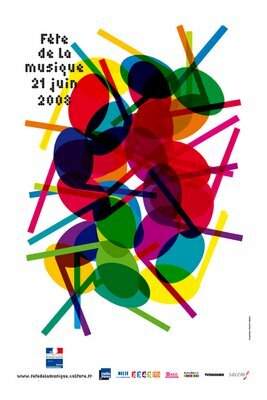 The Fête de la Musique, also known as World Music Day, is a music festival taking place on June 21, which is usually the summer solstice. The Fête de la Musique began in France and has since spread to Belgium, Britain, Luxembourg, Germany, Switzerland, Costa Rica, Israel (in Tel-Aviv), China, India, Lebanon, Malaysia, Morocco, Pakistan, Philippines, Romania, Colombia and other countries. New York City held its first festival in 2007 and Seoul in 2008 ! The idea was conceived by French Music and Dance director Maurice Fleuret for Minister of Culture Jack Lang in 1981 and first took place in 1982. Amateur and professional musicians are encouraged to perform in the streets. The slogan “Faites de la musique” (Make music), a homophone of “Fête de la Musique”, is used to promote this goal. Many free concerts are organized, making all genres of music accessible to the public. The Fête de la Musique is one of the few nights of the year where, under French law, there is no noise restriction. The musicians can play all night without fear of neighbours calling the police. When, in October 1981, Maurice Fleuret became Director of Music and Dance at Jack Lang's (former Ministry of Culture) request, he applies his reflections to the musical practice and its evolution: "the music everywhere and the concert nowhere". When he discovered, in a 1982 study on the cultural habits of the French, that five million people, one child out of two, played a musical instrument, he began to dream of a way to bring people out on the streets. And thus, in a few weeks' time, the Fête de la Musique was launched on June 21 1982, the day of summer solstice, a pagan night which recalls the ancient tradition of Saint John's feasts. Given the immediate success of this popular and largely spontaneous event, this gathering of professionals and amateurs musicians, with its new focus on all kinds of music, was the incarnation of a policy striving to give an equal place to amateur musicians, to rock, jazz, singing and traditional music, all of which were given a chance to be heard alongside so-called "serious" music. The free concerts, the SACEM's support, the media's help, support from territorial municipalities, and participation of an ever increasing share of the population...made it one of the major French cultural events, in only a few years. It began to be "exported" in 1985 (the European Year of Music). In fifteen years, the Fête de la Musique would be taken up in over one hundred countries throughout the five continents. Though the European dimension remains the most visible one, now that Berlin, Budapest, Barcelona, Istanbul, Liverpool, Luxemburg, Rome, Naples, Prague and the French Community of Belgium, Santa Maria da Feira have signed the "Charter of the partners of the European Festival of Music", the Fête has also taken root in San Francisco, in New York this year, in Manila, and has practically become the national feast in many African countries, not to mention Brazil and Colombia. Tough its success is most obvious in big cities' hearts, many other dimensions lie behind : it visits prisons, shares the lives of hospital patients and personnel, brings together educational establishments and music schools, creates links between cities and suburbs, brings a fresh breeze to rural communities, highlights the months of efforts of an individual, a group, an association, or even an entire community. While avoiding formality, the Fête de la Musique naturally promotes democratisation of the access to artistic and cultural endeavours. The success of the Fête is, more than anything else, due to the efforts of the many networks which are brought into play before June 21st. These can be institutional, like Operas houses, national and regional Orchestras, Chamber music ensembles, Conservatories, Music schools... or professional, like the Scènes de Musiques Actuelles (SMAC) and the Cafés Musique or the Antennes du Printemps de Bourges. On this occasion, the major amateur federations ensure the involvement of all of their members throughout France, whether in the French Musical Confederation for Fanfares and Harmonies, or the A Coeur Joie for the choirs. Social and cultural institutions, as well as local associations, help to bring out the new musical expression. The vitality of the Fête also depends on the energy of the many volunteers who individually do their best to make sure this exceptional day is rich in spontaneity and in its expression of youthful abandon. In a generation, the Festival displays its constant capacity to reinvent itself. Ingenious and vivacious, built on institutions yet choosing - like music itself - to live its life in the streets, the Festival is carried along by the people who bring it to life.